Amanda, the daughter of good friends of ours, recently got married. It was a hectic summer so she opted for a shower after all the other festivities calmed down. It seemed to be a great idea to include the guys by having a couples shower with an autumn theme. Amanda and her new husband Darren love chili, so I spent today digging out two of our family favorites - regular tomato ground beef chili and white chicken chili. They have a track record of satisfying a man-sized appetite. Both of them call for the very same spices, but due to the difference in the major ingredients, they are strikingly at opposite ends on the chili spectrum! We like black beans in the red chili, but kidney beans are great as well. I like to keep a large jar of the spices used in this recipe already mixed up. I use this spice combination in almost any Tex Mex dish I make and my family never seems to get tired of it. The basic proportions are: 1 teaspoon chili powder, 1 teaspoon cumin, 1/2 teaspoon salt, 1/4 teaspoon pepper, and 1/4 teaspoon garlic powder. To go with the chili, I baked up some savory corn muffins. They feature mild green chilies, monterey jack cheese, and cumin. The aroma of these flavors baking together is amazing! Brown the ground beef along with the diced onions over medium heat. When the meat is evenly browned, drain off any grease. Add everything else to the pot and let it simmer for about 15 minutes. Top with diced onions, shredded cheddar cheese, oyster crackers, fritos, sour cream, fresh jalapeno slices, etc. Saute the onions and celery in the olive oil until they are nice and soft. Add the chicken broth, chicken, beans, spices and simmer for at least 15 minutes. Take the chili off the heat and either serve it this way with the sour cream and cheeses as garnisher OR (what I do), stir in the sour cream and cheeses and garnish the bowls with sliced green onions. Mix the dry ingredients together, then add the wet ones in and stir until everything is blended together. Use cupcake liners or a nonstick muffin pan. (I still "grease" my nonstick muffin pan with a little butter). Spoon 1/4 cup of batter into each well in the pan. Bake in a preheated 425 degree oven for 15 minutes. They should spring back when you tap them and be browning on the top and sides. The end of summer always seems to bring in a bumper crop of egg plant and I love to cook up a batch or two of yummy Eggplant Parmesan. Jenn and Roy have been asking for it and I was happy to make this family favorite. It is rich and delicious and once a guest thought I was pulling his leg when I said it was eggplant and not veal. Honestly, it's that good! 1. One of the reasons this dish is yummy is that the sauce is nice and rich! So the first thing you want to do is make this quick, easy sauce and let it simmer on low heat while you are messing around with the eggplant. In a saucepan mix together 2 (15 0z.) cans of tomato sauce, 1 tablespoon sugar, 1/2 teaspoon salt, 1/2 teaspoon powdered garlic, 1/4 teaspoon of crushed red pepper flakes, 1/4 teaspoon pepper, and 1/2 teaspoon dried oregano. Let it simmer on low heat while you deal with the eggplant. 2. Cut the ends off and peel 1 good sized eggplant. Cut it into 1/4 inch slices. Mix 1/2 cup flour, 1/4 teaspoon salt, and 1/8 teaspoon pepper together in a bowl. In a second bowl whisk 1 egg and 1 tablespoon milk together. In a third bowl mix together 1/2 cup dry bread crumbs, 1/4 cup grated Parmesan cheese, and 1/2 teaspoon dried oregano. 3. Do yourself a favor and use tongs if you have them! Take a slice of eggplant and dredge it in the flour. 4. Then dip the flour coated slice into the egg mixture. 5. Last, cover the slice in the bread crumb mixture. 6. In a frying pan, heat up about 6 tablespoons of olive oil. In batches, brown the coated egg plant slices on both sides. Watch carefully that the pan doesn't get too hot, because you want the egglplant to be golden brown, but not burnt. Place the browned eggplant slices on paper towels to absorb any excess oil. Spoon a little of the red sauce in the bottom of the baking pan that you are going to use and place the first layer of egg plant in the pan. 8. Finish by putting the last of the mozzarella cheese on top, poke into the sides any extra eggplant & cheese that you might have ended up with, and pour the last of the sauce over it all. 9. Bake at 375 degrees for about 50 minutes to an hour. If the top seems to be getting done too fast, put a foil "tent" over it to keep it from looking burnt. When there is about 5 minutes left, sprinkle the top with some grated Parmesan cheese. When Allison was a senior in high school, she developed a sweet friendship with a foreign exchange student from Spain. Carolina is intelligent, beautiful, and has a great sense of humor. However, she was a bit homesick and we were more than happy to have her over as much as she wanted to come! At graduation time, her entire family - mom, dad, brothers, sisters, and significant others - came to visit! We had a big midwest style cookout with them and had a great time getting aquainted. Carolina invited Allison to visit her in Spain and of course she went! One thing dish Allison talked about was the Gazpacho that Carolina's mom made each day for the main, middle of the day meal. Carolina's family lives in Badajoz which is about four hours southwest of Madrid and is right near the Portugal border. Allison says authentic Gazpacho is thicker than mine, but tastes about the same. Traditional Gazpacho has bread in it, but because I count carbs, I chose to leave it out and sometimes opt for some yummy croutons instead. I love to pile in the garnishes - especially chopped hardboiled eggs. This makes it a great brunch option as well as the main dish in a light lunch or first course in hot weather. It tastes even better if you make it the night before! 1. Dice 3 tomatoes, 1/2 of a seeded cucumber, 4 slices bread (I leave bread out), 1/4 green pepper, 1/2 onion. Process the ingredients in a food processor. Pour the mixture in a glass bowl and stir in 1 tablespoon olive oil, 1 tablespoon red wine vinegar, 1/2 teaspoon salt, 1/4 teaspoon pepper, 1/8 teaspoon cumin, and 1 clove of garlic that has been finely minced or put through a press. Cover with plastic wrap and refrigerate for at least two hours, but the longer the better for the flavors to blend. 2. To make the garnishes, cut up another tomato, and what is remaining of the seeded cucumber, green pepper and onion. Dice up a couple of hardboiled eggs. Make croutons by taking cubed bread and browning them in a skillet with 1 tablespoon of olive oil. 3. Pour the soup into bowls and pick your individual garnishes! 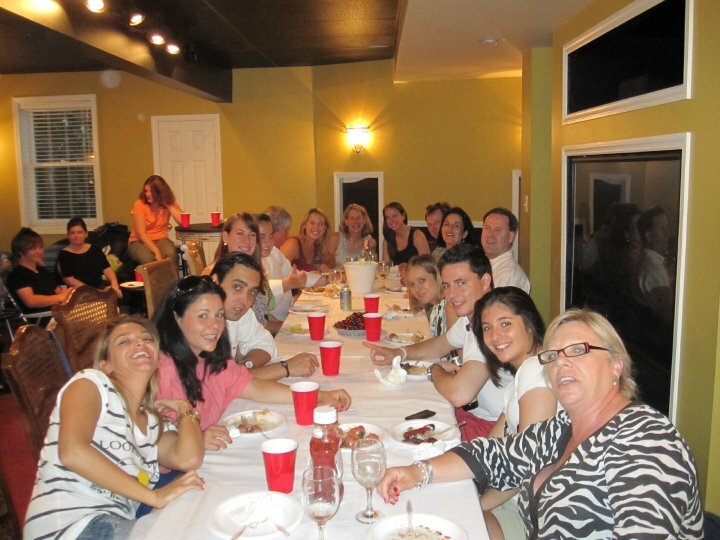 Here we are with Carolina's family - the only place we could all fit as one group was the basement!